In the absence of traditional Antarctic recipes we have come up with some ideas with an Antarctic theme that can be easily replicated with common ingredients. 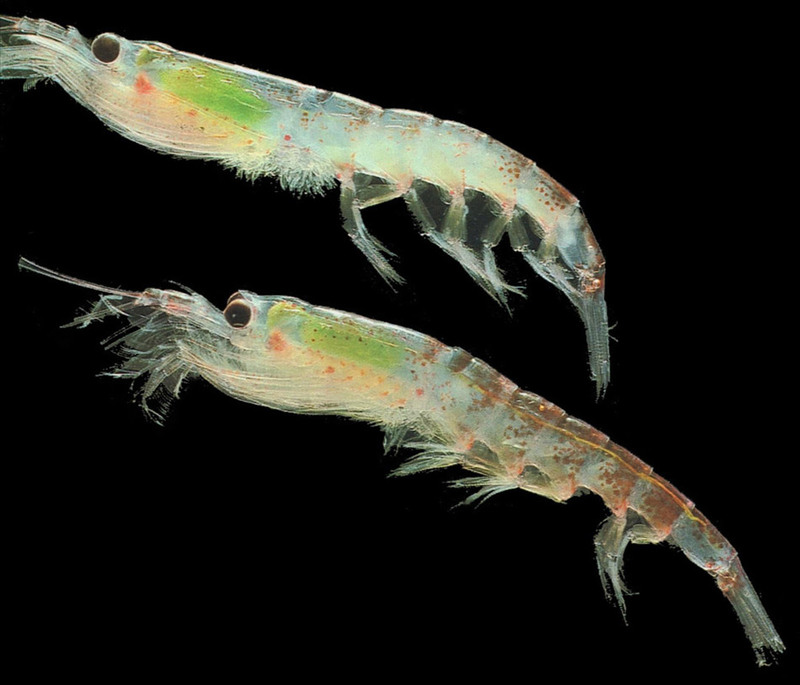 Krill is a crustacean that lives in the sea and is crucial for the Antarctic food web. It is a herbivore that feeds on phytoplankton (phyto - plant) and also some smaller zooplankton (zoo - animal). It is itself a member of the zooplankton as it moves at the mercy of ocean currents rather than being able to actively swim against them (the definition of plankton). It uses a "basket" made from its front legs to filter out the plankton from the water. It is very good at this. Krill eat a lot of phytoplankton concentrating the food into much bigger pieces of food - the krill themselves, which are then eaten by almost anything and everything else that can fish in Antarctic waters. Cook the rice by the absorption method whereby you add about a half a cup of rice to three times the volume of water. Add the green food coloring at the start of cooking according to the instructions on the bottle. 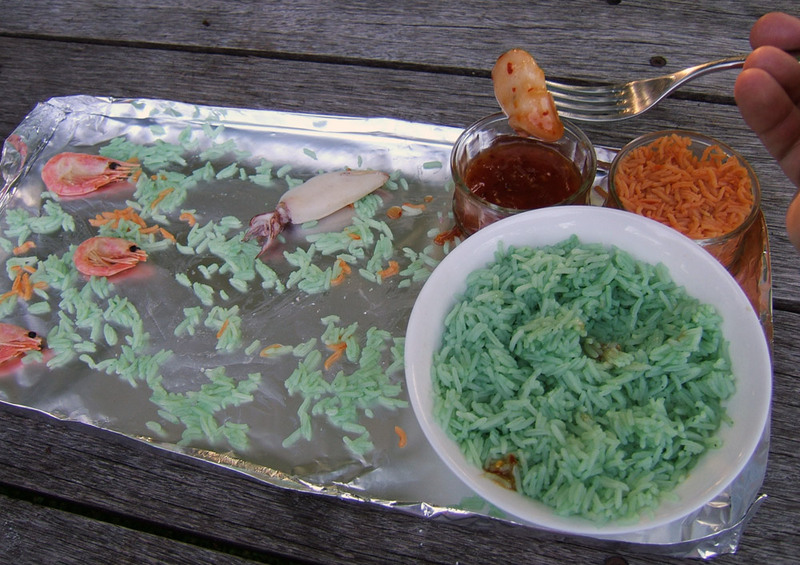 This way as the rice takes in water and swells, it also takes in the food coloring. Wash the starch off it when its cooked. Cook about a third as much of this rice to which you add red coloring instead, you'll have to do them in different pans to avoid a mess. I bought a bag of frozen ready-cooked prawns and prepared uncooked small squid. Defrost a few prawns and a couple of squid. Cook the squid by frying in a shallow pan in a little oil for a couple of minutes on each side, then remove and pat dry and remove excess oil with kitchen towels. Assemble the food chain on a suitable background. I couldn't find anything blue to represent the sea so I made do with a tray I made from cooking foil with folded edges. You could use a blue plate or even a suitably cleaned blue tray if you have one to represent the sea. Spread the green rice around, this represents the phytoplankton, sprinkle over with a little red rice which represents the zooplankton. 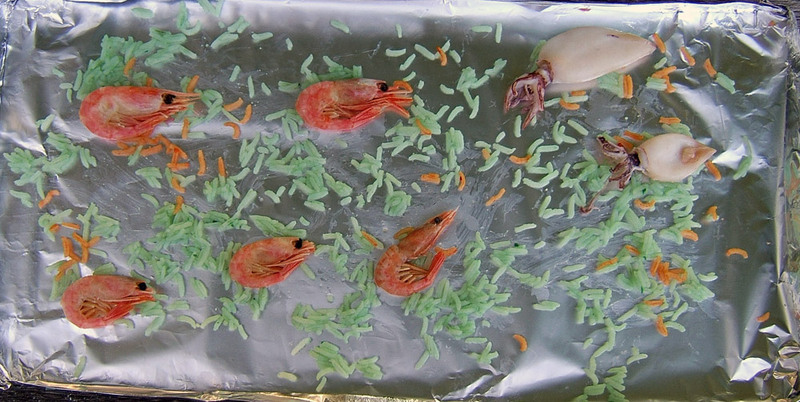 Now position your prawns (playing the role of krill) and squid, (guest starring as itself). You could use fish instead of, or as well as, the squid and whatever prawns are available. I thought it needed some sauce to go with it as it was a bit boring and went for sweet chili because I like it. It doesn't represent anything much but means that your food chain becomes more of a meal. Add the water, vinegar and sugar to a pan and bring to the boil, add the ginger, garlic, chili and ketchup and simmer for 5 mins. Mix the corn flour/cornstarch with a little water and add at the end to thicken the sauce. Most things are variable according to taste, sugar, chili, garlic and ketchup. As you go along a food chain, you get fewer organisms, though they are usually larger.